This article covers Manual Assignments. Permissions and Assignments allow administrators to limit portal users' permission to specific submissions, so as to avoid conflicts of interest. Further, they can assign responsibility to each person involved in the process to review and provide feedback and also track the status of that feedback. One way to tailor these assignments is based on a submission or based on a member. In other words, an administrator can go submission-by-submission and assign a member or group of members to those submissions, or inversely, go member-by-member and assign them to a submission or group of submissions. This process is known as manual assignments and would work best with a small group of submissions or if the administrator has a very specific means of assigning that isn't necessarily based on criteria in the submission. 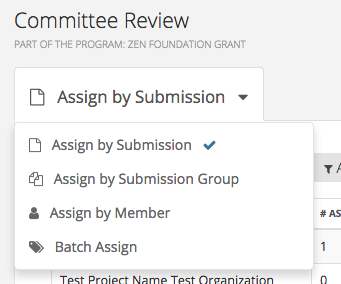 Setup a feedback process, then turn on the permission assignments feature by modifying the Permissions so that Members can only view submissions that are individually assigned to them. Link to the Portal users form. For example, a review form must include a link to the Reviewers form. Click on the Program Manager tab in your Navigation bar. Click Edit Assignments for the Process for which you are setting up Assignments. You can then choose the Assignments method that you want to use. In this article, we will focus on Assign by Submission and Assign by Member. Learn more about Batch Assignments and Dynamic Assignments. The submissions list on the left will list the submissions that meet any filters that have already been created. You can also search for a particular submission by name, or use the filter tool. Once you have selected a submission, on the right hand you can see which portal members the submission has been assigned to. These are the users that have permission to view the submission. You can assign additional members via the green Assign button. You can also remove an assignment for reviews that have not been started. In Progress and Submitted assignments cannot be removed. Throughout the process, you can return to this tab to review the progress. This is important for ensuring that each submission is being fairly reviewed by the appropriate number of people and that no reviewers are falling behind. 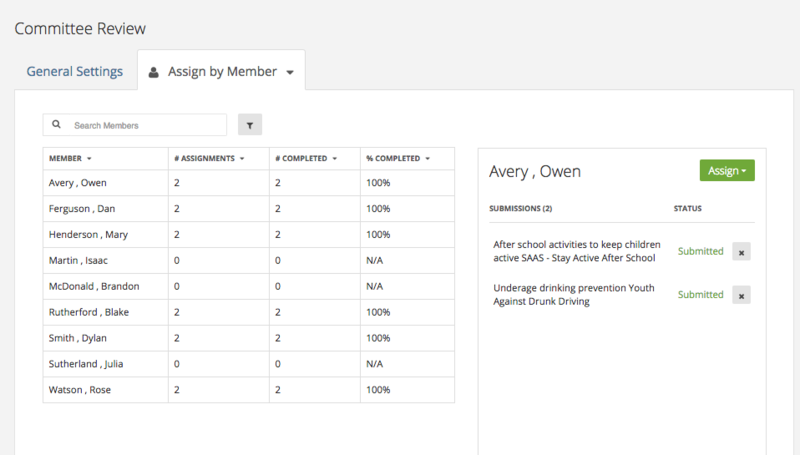 The Assign by Member option is similar to the Assign by Submission option, but you will see that the portal members are listed on the left, while the possible assigned entries will appear on the right. All portal members are listed, but you can optionally filter the list. This is useful if storing additional data about the reviewers such as geographic location or committees. Once you have selected a portal member, on the right hand you can see which submissions that person has been assigned to. You can assign additional submissions via the green Assign button. Throughout the process, you can return to this tab to review the progress. This is important for ensuring no reviewers are falling behind with their assignments.